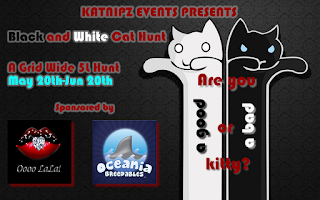 The first Black and White Cat Hunt has started and I wish all stores and hunters good luck!!! Beware, that this is a 5L hunt but some stores may put their item up for free. It is very important, that you do not contact the store owners!!! If there is a problem with the item please contact Kralicecik Dufaux instead. THANK YOU.